13 February 2017, at 12:00a.m. UK - Although the SPP has dropped back a shade and now stands at 149.96p, supply and demand seem to be more or less in balance and prices today were of a “positive stand on“ nature rather than a positive pee off“! writes Peter Crichton in his "Traffic Lights" commentary for 10 February. Weekly announced prices have all remained at last week’s levels generally within the 145p – 150p/kg range and spot quotes have also held firm with possibly the odd copper available in places. 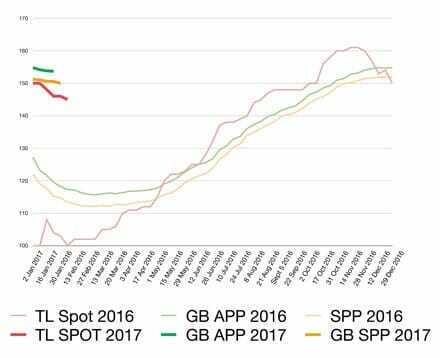 Although the spot market only represents a very small proportion of slaughter pig numbers, rather like the auction markets in the “good old days”, they still provide a ready barometer of which way prices are heading. Although the Euro eased a touch in value trading on Friday worth 85.25p, compared with 86.19p this time last week, cull sow prices have held at similar levels with the odd hint of possibly an extra penny or so available for sellers with large loads. As a result, most cull sow bids were in the 90p – 93p/kg range from the two main buyers. 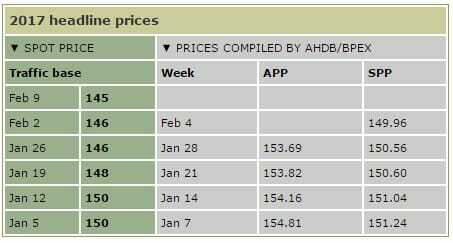 Weaner prices have continued to maintain recent trends with the latest AHDB 30kg ex farm average quoted at £54.98/head, but the 7kg figure has eased from £39.28/head to £38.22/head, although this sector still remains very much a sellers’ market. Despite record global grain stock levels, cereal prices continue to defy gravity and have remained at remarkably firm levels considering the volumes which are available with UK spot wheat trading on an ex farm basis at £142/t and LIFFE futures prices £6 - £7/t ahead of this, with March 2017 quoted at £147.40/t, July at £149.70/t, but November values easier at £138/t. Some good news as far as bacon sales are concerned, with the AHDB reporting a 6 per cent year on year increase in volumes for the final 12 weeks of 2016 with over 40,000 tonnes of bacon purchased by GB retailers, but it seems that the whole supply chain is being led by the value of the bacon pig rather than the lighter fresh meat pork end of the market where volumes are still reported to be quiet and showing no real growth. And finally, as the date for our “Brexit Exit” approaches and assuming we leave the EU on the 1 April (April Fool’s Day) 2019, which will be approximately 2 years after the anticipated triggering of Article 50, this will leave us around 780 days until we find we are looking through the other end of the telescope as far as Europe is concerned. In the meantime it will be interesting to see how the Euro performs; as this will have a huge influence on the value of all pigmeat and other imports and exports. Any recovery during the pre-exit period in the value of the GBP would be bad news for the pig industry as far as pig prices are concerned and we will have to keep our fingers crossed that the GBP remains weaker than it was prior to the 23 June 2016, or we could see imports undercutting our market at a time when the whole UK pig supply chain needs all the help it can get.